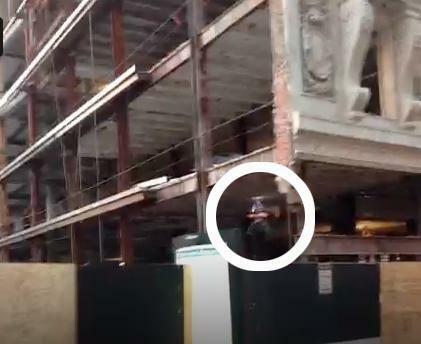 A video screen grab shows a small drone (circled) buzzing around the Filene’s site earlier this month. Shoppers along Washington Street may have been surprised earlier this month to see a tiny helicopter hovering over the former Filene’s site in Downtown Crossing, taking photos of the view from what will soon be a window in the new skyscraper going up there. It was a drone, captured on a Vine video and posted to Twitter. And it was illegal. The site’s developers, Millennium Partners, claimed the drone was operated by a firm hired by their public relations team to shoot marketing photos. But in Los Angeles, police have cracked down on real estate photography taken by drones, saying such practices violate federal airspace. The Federal Aviation Administration regulates drone flights in public space, and won’t be licensing commercial drone flights until 2015. Only a relative handful of organizations are allowed to fly such unmanned aerial vehicles. The FAA has said that operating a drone without a permit, for commercial purposes, is illegal. But it’s unclear if local law enforcement even knows or understands what constitutes illegally flying an unmanned vehicle. Hobbyists, for example, may fly toy helicopters. But the time is fast approaching when local authorities will have to unravel the ambiguity in the laws about what constitutes a drone, and the consequences for flying one. For now, a drone may simply be a buzzing curiosity along a downtown street. But such tiny camera-laden helicopters can pose risks to both privacy laws and public safety, and the city should be clear about who can fly them, and how to deal with rule breakers.